The retreat began today! 3 days of creating fun! This is the 17th retreat in eight and a half years. Every retreat has a theme- this time we did a beach and leaned more mermaids and sand castles. 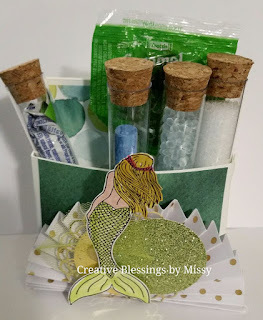 Here is a gift for the retreat attendees It's a cute stand up holder that holds 4 test tubes filled with goodies and a treat. The Ornament kit in the holiday catalog made this quick and easy - and love the stamped mermaid image. Lots of posts to come this weekend.